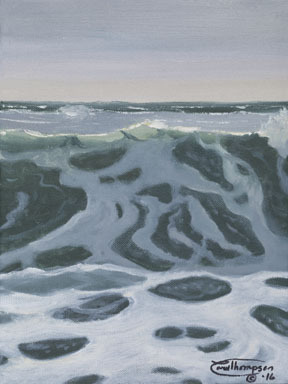 "An `overcast` day finds the wind blowing and the surf rising up with foam patterns decorating the waves." Artist comment: "This small painting is side 'A' or the left half of a diptych seascape. It was an interesting venture to see what could be accomplished on a small scale. I have done larger pieces and I even did a set of five interacting pieces which could be switched to any position among them and still be a great seascape. Before beginning this diminutive set, I positioned the two canvases side by side and sketched the scene on both at once, carrying the design from one to the other. Still keeping them next to each other, I painted the entire scene as though it were one. When they were completed, I signed them as individuals." "Overcast (A)" is a limited edition, giclée print from an original oil painting by Carol Thompson. The edition includes 3600 authorized, signed, limited edition prints (3500 numbered and 100 artist proofs). Release date is April 2016. Image size and substrates vary. All prints are signed and numbered by the artist and include a certificate of authenticity. Paper prints are shrink wrapped on foam board. Canvas prints are coated with a protective spray.